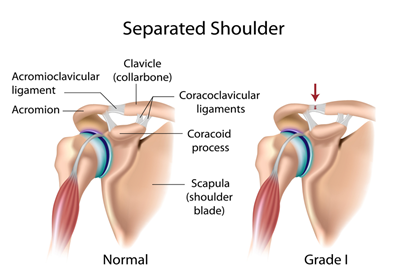 The Acromioclavicular (AC) Joint is the joint between the collarbone and the shoulder blade. It is the only bony joint attaching the upper arm to the body and is essential in transferring forces from the arm to the trunk. To keep the joint stable it is reinforced by three thick ligaments; the Acromioclavicular, Coracoclavicular and Coracoacromial ligaments. HOW DOES IT BECOME SEPARATED? A tear of the AC joint usually occurs from force directly on the shoulder, often from falling, car accidents or tackles during sport. As with all injuries, there are different degrees of injury. With mild injuries, only a few fibres are torn or stretched. In very severe injuries the collarbone and shoulder blade are completely dislocated. This injury is referred to as ‘separated shoulder’. After an AC joint injury there is usually immediate pain on the top of the shoulder, swelling and bruising. There is often loss of movement of the shoulder, and pain from putting weight through the arm or carrying heavy objects. In severe cases there is a visible lump on top of the shoulder, known as a ‘step deformity’. To confirm the diagnosis, your physiotherapist can perform some simple tests. An X-ray can help to grade the severity of the injury. The first line of treatment is RICE (Rest, Ice, Compression, Elevation) to minimize inflammation over the first 48 hours. Ultrasound and NSAIDS can also be used to reduce swelling. After this initial period it is important to note that a severe sprain of the AC joint puts quite a lot of stress on the muscles that support the shoulder. 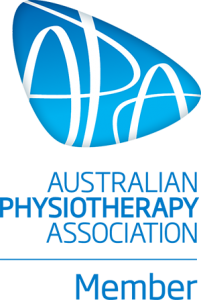 The role of physiotherapy in this case is to ensure the joint is supported and given a chance to heal naturally, while maintaining the strength and normal movement of the shoulder girdle. This is done initially by providing support to the joint. You may need to have your arm supported in a sling or brace for some of this time and your physiotherapist can show you some taping techniques to add support. Heat and ultrasound are other treatments which can speed up healing. To maintain the health of the surrounding muscles, your physiotherapist will prescribe exercises, ensure the muscles keep a normal length and treat any trigger points. Most AC joint sprains take six weeks to fully heal, although many patients report shoulder problems in future years. For this reason a comprehensive rehabilitation program is very important. Very severe sprains are often treated with surgery to reattach the joint and treat any possible fracture.